Food Styling By Brian creates custom fruit and vegetable carving displays that are sure to wow your guests and give your event that extra flare. 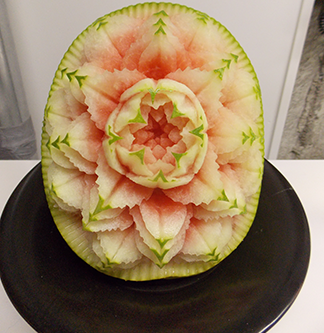 Whether its a single carved fruit, a vegetable floral arrangement, or a whole table display we can work within your budget to give you that perfect look. With a gold medal showpiece in Toronto’s Culinary Salon 2012 we have the qualifications to stand by our work. Please visit our site for more information.